This report by the EIS falls far short of exploring the historical importance of Thompson Square both for the Square itself, the township of Windsor and indeed the Nation. Scant reference is made to the social significance of Windsor and especially Thompson Square in the formation of the character of this our nation. It was in this square that a dedication took place that has echoed down through the centuries and helped make us what we are. The RMS seems oblivious of the value of symbolic places and events as it immerses itself in the minutia of government required check lists. This significant consideration revolves around the unlikely spiritual association of three very different men that demands attention in any plans regarding Thompson Square. These men were Andrew Thompson, Governor Lachlan Macquarie and William Wilberforce. The EIS Report says that the Square is of at least State significance but it is of at least National Heritage significance as stated by the latest release of items on the list of the National Heritage. The lives and contributions of the aforementioned men, influenced by the great ideas of the time, made an indelible mark on the young colony which formed the basis of an ideal which underpins our Nation today. When Lachlan Macquarie had Bell Post Square re-named Thompson Square the name was “ writ large into a plank and then nailed onto a post.”.....the letters were painted with paint brought specially by Macquarie for the occasion. Paint was a rare and expensive commodity in the early colony as only limited amounts were sent out from England and all supplies were under the watchful eye of the Governor. Macquarie, in writing the name of Andrew Thompson, in effect, signed a great “contract” with the ‘State’ and those who were to become the Australian people......Andrew Thompson stood for the people, Macquarie the State and Thompson Square was the “paper” on which it was written. This was the great “unwritten contract” that every Australian now takes as their birth-right and every immigrant who comes here to live does so knowing of the benefits it bestows. This “contract” embodies the ideals of Egalitarianism; the idea that that a person’s past should not be used to inhibit their future ability to contribute in a positive manner to their community and to other fellow human beings; and the idea of “ a fair go”. Thompson Square is a symbol of this great idea. All of these ideas and ideals come together in Thompson Square and the story begins in the little town of Yetholm, Scotland in 1773 when Andrew Thompson is born. He is the 6th child of John and Agnes Thompson. His father was a manufacturer and dyer and Andrew , educated at a parochial school, worked in his father’s business until illness forced him to study for the excise. But Andrew fell foul to “youthful indiscretions” and was convicted of stealing cloth. He pleaded guilty and was sentenced to 7 years transportation. He became his family’s “outcast goat” and in 1791 he and 401 other convicts set sail on the “Pitt”, arriving in Sydney on the 14th Feb. 1792. Also on the Pitt was Benjamin Singleton, convict and later founder of Singleton and fellow explorer of John Howe. Also on board was Lt. Gov. Francis Grose, his wife and 3 yr old son; John Piper, military officer, of Point Piper fame; Thomas Rowley and his wife, Elizabeth( who died on the voyage) and a female prisoner, Elizabeth Selwyn, who became the second Mrs Rowley. Thompson was a person who impressed all the Governors of the colony up to and including Macquarie. Gov. Phillip first gave Thompson a ‘lift’ by recommending him to his successor and in 1801 Thompson was appointed Chief Constable by Gov. King. After working with distinction in the men’s provision store Thompson joined the fledgling constabulary in 1793, serving with similar distinction at Toongabbie and other centres. In 1796 Gov. Hunter appointed him to Green Hills, which he made his home and where his entrepreneurial skills came to the fore in areas such as farming( Andrew acquired many farms in the Hawkesbury and also at Minto) running them all with great efficiency. He also became a brewer, hops grower, a boat builder, bridge builder (first bridge over South Creek), salt manufacturer at Scotland Island, overseer of Bligh’s farm at Pitt Town, tanner, store owner, grain producer and race horse owner. When Macquarie arrived in 1810, he appointed Andrew to Justice of the Peace and chief Magistrate of Windsor. This was the first appointment of an emancipist to such an office and in doing so; Macquarie earned the ire of the Exclusionists who regarded convicts, fully pardoned or not, as not fit company and as “always a convict”. But Macquarie and his Lady Elizabeth were influenced by the ideas and ideals of their friend, William Wilberforce, the great emancipist of the slaves. In letters that Wilberforce sent to Macquarie in Sydney it can be seen that they discussed the nature and treatment of the convicts under Macquarie’s care and that they were in agreement that if treated well most convicts would repent their indiscretions and would make good contributions to society. In Macquarie’s eyes the convicts were the ‘slaves’ of the colony. When on their voyage to Australia, the Macquarie’s ship had encountered a Portuguese slave trading vessel and they had been made terribly distraught by the treatment of the female slaves. There was a fever on board and when a slave showed any signs of illness they were thrown alive overboard. Such brutality left them both determined to implement as many of Wilberforce’s ideas as possible and so within two months of his arrival he appointed Andrew, not a free settler or an Exclusivist of wealth or importance, to this very high position. One of Macquarie’s five towns is named after this remarkably humane and forward thinking man - Wilberforce. 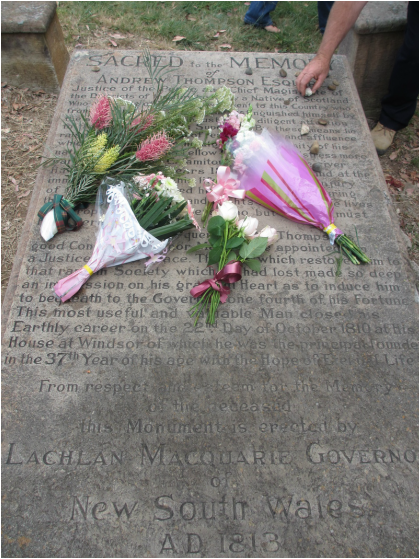 When Andrew Thompson died in Oct. 1810 he epitomised the ‘freed slave’ ideal of Wilberforce and Macquarie. He had risen to become one of the most respected and wealthiest men in the colony. He died after a chest condition contracted after he spent many days in flood waters rescuing 109 settlers from the floods of 1806 and 1809. He used his boats to pluck the settlers of the Hawkesbury from their roof tops and flood waters. Andrew Thompson was one of our Nation’s first heroes. Macquarie honoured him in death with a large ceremonial funeral and a lengthy epitaph. His was the first burial to take place in the grounds of what was to become St Matthew’s Church. Andrew Thompson had redeemed himself in a place that offered him the opportunity to prove himself unfettered by social class. So it was that just three months after his death, Macquarie and his Lady Elizabeth returned to Windsor to visit the grave of their friend and to name the Square for him. Macquarie called him the Father and Founder of Windsor and he created a memorial to him in the naming of the Square. Thus it was in this act that the ‘contract’ was ‘written’. So what is the nature of this unwritten contract that makes Thompson Square unique? After the Rum Rebellion the colony was heavily divided. The two groups that vied for setting the destiny of the colony were known as the “Exclusivists” made up largely of landed and property people and the officer corps – those that sought a society based on class, religion and ethnic background where an underclass served a landed upper class not unlike North Carolina. The other group were the “Emancipists” which were a mixed group of free thinkers and had the support of the Irish, convicts and poorer settlers. Past Governors saw merit in the Emancipists ideals and Governor Bligh was partly destroyed in the protracted battle between them. Essentially the new colony of Australia was to become the first trial test bed for the concept extolled by the free thinkers in Europe, England and the Americas which believed in the concept of the “noble savage” and that divided societies created dysfunctional societies and the ills that resulted from them. They believed that if true egalitarian societies could be made under heaven as God intended where all citizens were given the opportunity to prove their worth and respected as equals unrestrained by birth, class or beliefs they would make moral citizens. Governor Macquarie and his wife were unlikely supporters to this course but fully embraced it though in the end it destroyed his career and shortened his life. Governor Macquarie outraged the powers that be by giving 1000’s of convicts conditional pardons and freedom early in his administration to construct their own destinies in the new colony irrespective of ethnic origin or religion. He added to this by appointing an ex- convict to the rank of a Magistrate and then magnified this further by declaring the first public square in Australia not after a king, prominent free settler or Governor but rather a convict that had redeemed himself through hard work and strength of character. This was a calculated action that all understood and aligned him permanently with the Emancipists’ course. It is in this that Thompson Square attains a national significance well beyond just being a park. It is here that the concept of “a fair go” that underpins the national character has its clear reference point. It has been claimed that Australia is the greatest example in the world of a successful penal reform system. In this Andrew Thompson even at the time was recognised as its precursor. In light of this Thompson Square takes on an international significance in the evolution of social thinking. All countries have significant places that are totems for what they believe and mark the journey they have taken – Thompson Square is such a place. Like most places that underlay major social changes it lacks the drama of dramatic sites such as Gallipoli or Glenrowan but its social impact was much greater in moulding the nations character. In all the detritus over the RMS proposal the symbolic significance of this area has been largely overlooked in their EIS submission and given minimal worth. This is a major flaw in the RMS submission and undermines their whole proposal to alter the square. Beyond that, this area was to play a major part in our early colonial history. All the early Governors regarded Windsor as paramount in the survival of the colony because of its agricultural richness and river trade. Thompson Square was at its centre. It is no accident that in the Vinegar Hill Uprising the rebels sought to secure Windsor and its produce before taking Sydney. At an international level the importance of Windsor was recognised in Washington and Paris when the fledgling Independent American nation and France were at war with England and Lord Bathurst informed Governor Macquarie that a joint military action may be expected to take Windsor and the garrison in the square in order to cut off the colonies food supply prior to invading it. The execution of Cunningham, the leader of the Vinegar Hill Uprising, at the corner of the park, where traffic will rumble past, and the mass burial of those that fell interned at the bottom of the hill near South Creek gives testimony to these events. As does the building of the Macquarie Arms Hotel in the square under government instruction to act as a military support depot if needed and Governor Macquarie's often attendance at the Government Domain testifies to the great importance the square had during his administration. Governor Macquarie always regarded Windsor as very important to the fledgling colony and lavished money on its built heritage which caused him great problems and in laying it out with a public square and a common near his grand church he sought to set in brick and stone a model new community based on new age concepts of how societies could be modelled in the empire. This place does not deserve to become a thoroughfare for 1900 plus trucks a day. Seventy percent of the traffic which enters the Square today is through traffic. This place deserves to be respected and retained as a quiet precinct where citizens can come to learn about the story of the Square and understand what it symbolizes for all Australians. In all this development application this subtle symbolic aspect has been overlooked. It holds significance in the same scale as Old Government House in Canberra and dozens of our war memorials dotted around the world. With these examples and many others it is recognised that not only specific objects are important but the context they are framed within. The RMS has treated with contempt this framework that cradles places they even recognise are of major importance. Everything is contextual and as an elevated by pass meters from the war memorial in Canberra diminishes the symbolic value of our war dead so does this RMS proposal treat with distain the heritage of this colonial square. Claims that heritage values will be retained are insulting to any informed person and diminishes the person that writes or supports this proposition. The State Government should retain this whole precinct as a living ‘museum’, with explanatory plaques which tell the story of this great adventure into advancing the human condition and with statues of the major players in its history, plaques of Governor Macquarie's eulogy to Andrew Thompson and a replacement bell post to focus the thoughts of those who visit. This report was prepared for the CAWB EIS Response. Please read the full submission here.